This is the view today looking out my lanai's glass door (lanai=balcony). Those are not spots before your eyeballs nor from lint on my camera lens. Those tiny white specks are what they are....tiny white specks. Of paint, I might add. The painters started painting the building, ah I said painting, but I suspect that they're spraying the building instead. I wasn't around when they started yesterday. You cannot spray a high rise in Waikiki. 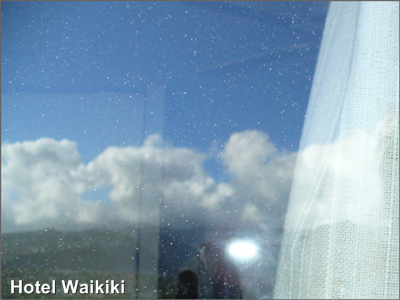 The trade winds will blow the atomized paint particles every which way as evidenced by the millions of tiny white specks sticking to the glass on my lanai door soon to be sunbaked for extra adhesion. The only proper method would be to mask off all the windows and jalousies that is if the painting contractor had 10 miles of masking tape with him. I'm not at all 100 percent sure whether the building management were fully aware that the painting contractor would be spraying the building. Or any sound reason why they would allow spraying. First of all, spraying leaves a thin coat of armor barely the thickness of sheet of paper if that at all. Now, it's not beyond painting contractors to incorporate ludicrous claims in their sales pitch that they use special formula paint with steroids mixed in for spraying. To paint that bridge I'll sell them. After a tab for the clean up thrown in. The last time the building was painted, the painters rolled the building slopping on a thick layer of paint that sagged from its own weight in some sections. 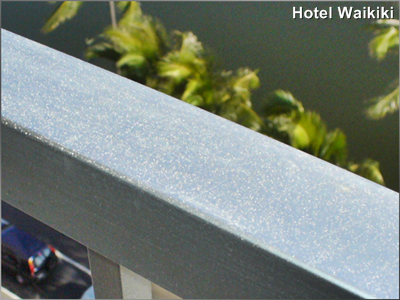 Every square inch of my lanai has been speckled like this from the overspray. No such thing as quality painters in Hawaii anymore then? Oh sheesh! That's terrible. Something like that happened to my cousin. The neighbor spray painted something and it got all over my cousin's car. No a happy camper, my cousin. When I spray painted my mailbox, Art held a huge sheet of plastic in the direction of the wind to catch any overspray. A big lawsuit in the future? A complaint to the contractors' license board is in order if there is no cleanup! The neighboring buildings will be complaining too! Ridiculous is right! And with the trades, who knows where else the makani too the paint! I hope it gets resolved soon. Brad- I wouldn't put sprayers in the same category as painters. In fact, I wouldn't use the term, sprayers, in the same breath as painters. Kay- thoughtful of you to use a plastic sheet while spraying your mailbox. Can you imagine the wind 12 floors up? Nate- I'm thinking about $200.00 per lanai for cleanup. You gotta use some powerful solvent to get that stuff off. Mokihana- "resolved soon?" Well, this is where the hot potato gets tossed back and forth. Cloudia- The posted size of the pics don't do the speckles from the overspray justice. Believe me. Kirk- Yeah, da lolos sure don't appear to be pros at this. All over the aluminum frame too. Terrible! I'd be very upset. gigi- "upset" doesn't encompass past screw-ups. The lobby was tiled and you had ought to see how off the lines and the level ended up on the gridwork. Permanently. Suppose to be square and flat. The tile person skipped town.